I finally got my desk cleared off again. Hooray! It had been piled high with paper work, books, mementos, mending, miscellaneous gifts, and unfinished craft projects, ever since Christmas. It’s amazing what a difference that one little change has made to my productivity! I finally have a nice, orderly place again to work on projects like the Retro Valentines below. Now I’m probably dating myself to admit it, but back when I was in grade school, boxed valentines didn’t exist. You couldn’t buy stacks of tiny cards ready to sign and seal in pre-made envelopes. Instead, they came in huge paper books. Books full of vintage designs and matching envelopes you had to cut out and assemble yourself. Many happy hours I spent snipping on solid lines, folding on dotted lines, and pasting the various embellishments where they went. 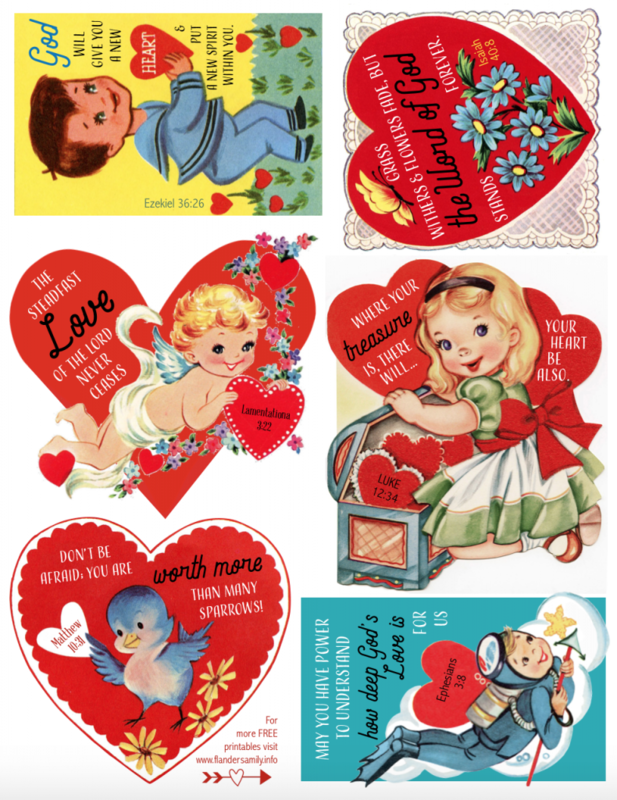 I haven’t seen those big books of do-it-yourself greetings for decades, but I did find some scanned copies of some old vintage valentines online, thanks to The Graphics Fairy and The Old Design Shop. But I’ve edited them to add Bible verses, instead. That only seemed fitting, in my opinion. If Valentine’s Day is all about love, what better LOVE do we have to celebrate than the marvelous, matchless, unending love of Jesus? I hope you’ll have as much fun clipping, trimming, and sharing these as I did designing them. And I pray that if you don’t already know Jesus, you won’t wait a moment longer to give your whole heart to Him. I love these and printed them out for my Wednesday night church students. The words are not coming out on them, looks like mailing stamps all over them. Is there some adjustment I need to make? Thought I’d let you know. I printed from your pdf. I’m not sure what the problem is. I’ve printed them from the PDF at home and they come out fine. I sent you a JPEG file for each directly to see if that will work better for you, but I’d encourage you to try the PDF one more time (and make sure the paper in your printer is fresh & clean), as the words seem crisper that way when I compare the two. I tried jpeg and it came out smaller, maybe I can print it out on Word by copy paste. I tried the other on cardstock, plain paper, new cardstock, etc. I got 3 pages to print right more or less (the yellow background one didn’t), and this will be enough. Thank you though. I tried adjusting to best instead of normal, didn’t really make a difference either. It is like the other wording with letters and numbers show through in boxes of white and black, over what you wrote. That is so weird. I’m really sorry it’s given you so much trouble. Are other printing jobs coming through properly? I’m wondering if your printer is set on an odd setting? Also, I’d be curious to know if any more of my printables are being altered when printing, or if it is just this one. Readers? Have any of the rest of you experienced this problem when printing any of my PDFs? If so, will you let me know. And if you figured out a work-around, please share it! Everything else seems to be right. I have a wifi printer that has instant ink sent from HP, about a year old or so. I did try to print business cards one time, and they wouldn’t line up. But everything else is perfect. I printed some things before from you and they were fine. I will look for something else to print from your blog. On this, I just clicked on a valentine and it went into a print ready form. Not sure if it is a pdf or not, but had a print icon that I clicked. Oh, how I love these retro Valentines! Thank you so much! May God bless and strengthen you daily. You’re so welcome, Renee. I’m glad to hear you like them. These brought back lots of memories. I would try so hard to cut on the lines.. I love that your Valentines have Bible verses. Thank you for sharing. You’re quite welcome, Mary. All that cutting made for some great practice on fine motor skills, didn’t it? 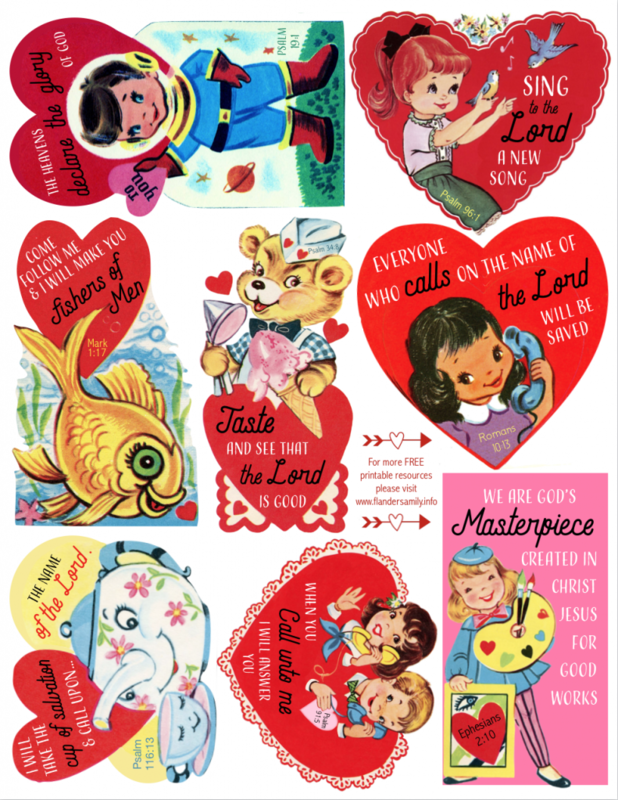 These retro Valentines are so cute! And the verses you added are perfect! Thanks, Tracy. I’m glad you like them!